Letter sign. Same as the number sign but A-Z instead of 0-9. 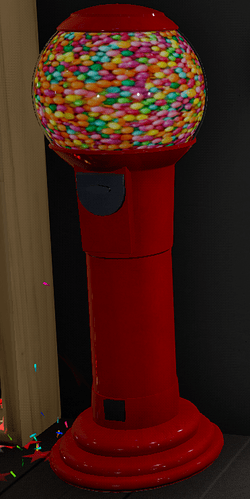 Not necessarily a new item, but it would be nice to have gumballs inside of the gumball machine. After tinkering with a spherical canvas and texturing it, I’ve gotta say, I think it looks great! And every time you eat a gumball it applies a random status effect to your character (small, large, drunk, etc.) for a short amount of time. Well, if you set the glow to around 0.05 to 0.1 on the cutout setting, it looks pretty clean. Not affected by ambient lighting either, as far as I’ve noticed. I’ve went ahead and ran some tests for you. The cutout setting is definitely not affected by light sources and will remain consistent even when the light is shining directly on the images. Here are 3 different glow settings (0.05, 0.3, and 1.0 from left to right). Even with a bright spotlight shone on the left one, it remains darker. It’s just a matter of playing around with the glow setting a bit. Ocean items! With the (hopefully) soon to be added water blocks we should get some underwater items to go with it! Sand piles, i use snow piles for my water gardens, doesnt work well unless in dark light, so this would be perfect. Ocean plants. Kelp, lilypads, corals, you know, sea stuff. GRUG WANT MORE ROCK. But really, more rocks to work with would be amazing. Sea life, you know, barnacles, maybe even fish that move around. Also some of those sunk ships/subs/planes on underwater. These would all be helpfull, though i personally really want the sand. Tip jar. Would have limits to the amount of units able to give and would have a long cool down. Could also have an option to announce to the condo their name, the amount of units and a message about them, would work like NPC dialogue. %name% just donated %units& units, what a chad! Plaza shop counters placeable in your condo. I dont know if this has been asked for yet but… CHRISTMAS LIGHT STRANDS! Multiple lengths, colorable and patternable bulbs. I want some of those sweet fairy lights strung around my condo, please! Since we’re nearing the holidays, what about some more cosmetics like an elf hat or a headband with reindeer antlers? Maybe a winter-themed scarf (red/green or blue/white) as another neck item? A snow globe has already been mentioned here before a few times, but I think it’s still worth considering, especially now that people can easily scale items down and make a little scene inside of it. I’d like to see Christmas stockings and standalone editable Christmas baubles (like the canvas sphere). Also candy canes, but those have been mentioned before too. Hello! Is there a favor, can not you make it possible to connect a MIDI keyboard to the piano? And I would like a semitone added to the piano! I hope to share music with others. There is software to hook up your keyboard to the game one, look in the steam guides.